Satori Chicken Recipe is the first Domestic Appropriate pet food specially designed to bridge the gap between your canine’s anatomy and modern lifestyle. Our chicken recipe has a logical approach as it considers canines, like the wolf, have digestive systems setup to efficiently process meat therefore it is grain free and made with fresh chicken. We then took it a step further by understanding our pets caloric needs are not the same as their wild ancestors since they do not travel 20-25km per day hunting and searching for food. These differences are the reason we adjusted the nutrition to fit their domestic lifestyle which consists of living in houses and backyards where their meals are served to them. Algae, a great source of Omega-3 and DHA. Probiotics applied externally after cooking to maintain a healthy digestive tract. 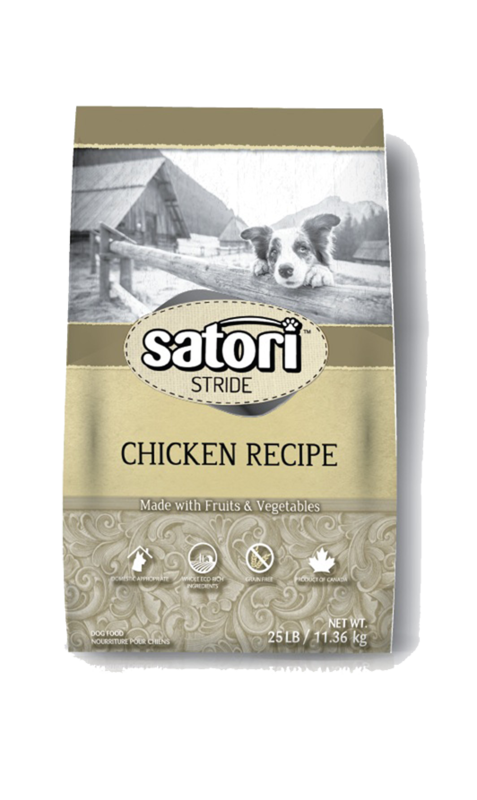 Satori Chicken Recipe Dog Food is formulated to meet the nutritional levels established by the Association of American Feed Control Officials (AAFCO) Dog Food Nutrient Profiles for All Life Stages.